Oil on canvas, 98 5/8 x 86 3/4 in. Monika Baer is known for an idiosyncratic body of work that employs a diversity of subject matter and stylistic and material explorations. Often called both conceptual and performative, Baer’s paintings are spare yet sensuous, oscillating between revealing and pretending to reveal themselves. Compelled to paint, yet refusing to embrace the existing models of what painting “should” be, Baer attempts to make fresh painting—in spite of, or perhaps because it is a medium so steeped in history and convention. 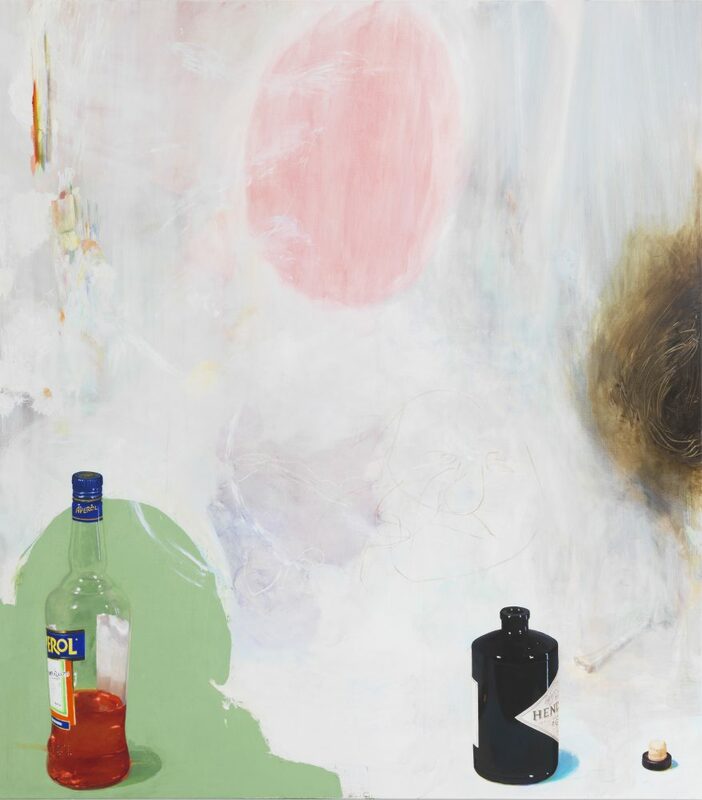 L is the second work in Baer’s series of six “alcohol paintings.” It is characterized by a pale, ethereal background of blues and pinks, punctuated with trompe l’oeil liquor bottles in the bottom foreground. The image refers to James Ensor’s The Artist’s Mother in Death (1915), which depicts rows of empty medicine bottles in the foreground and the artist’s prone mother in the background. While Ensor intentionally links the medicine bottles with death, Baer’s approach is less explicit; the subject here is not simply that which is depicted – in this case alcohol – but rather painting itself and the conventions that surround it. L is the first work by Monika Baer to enter WCMA’s collection. The acquisition of a major statement by this artist builds upon the collection’s strengths in feminist art and global contemporary art. By challenging and expanding the boundaries of the medium, L also significantly contributes to WCMA’s holdings of contemporary painting.